The beginnings of our guild can be traced to the Arrowmont school in Gatlinburg, Tennessee, in the 1960s and 70s, where pre-industrial arts and crafts were taught. According to our charter member Dale Liles, the inspiration for a regional revival of handspinning came from a teacher at Arrowmont, Persis Grayson. 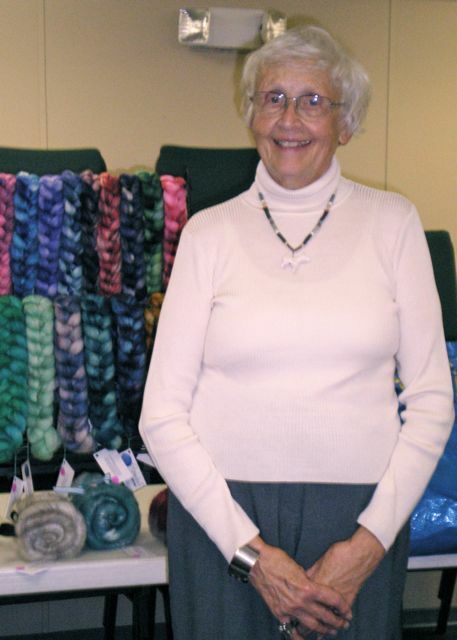 Persis taught her students how to spin, but she also taught much more: the history of fiber tools, the qualities of different fibers, the possibilities for fiber beyond spinning yarn—such as felting and dyeing. Some of her students raised silkworms and built wheels; many were weavers. Faculty and students from the University of Tennessee became involved, and students came from as far as New Zealand. They learned from each other as well as from Persis in a non-competitive and enjoyable atmosphere. The beginning class became an intermediate class, then an advanced one. Several local students including Dale Liles wanted to continue as a group beyond Arrowmont. One early member, a local librarian, recruited other librarians, and soon the word spread and Tennessee Valley Handspinners Guild was formed in the late 1970s. It was formally organized as a non-profit in 1981. One couple brought wheels to share; others donated fiber for teaching. Several members took workshops at Shakertown, KY. Activities included dye days, participation in an opera, the creation of several samplers for display at group demonstrations, and Roc Day celebrations. Over the years, the group has met in various places, and enrollment has risen and fallen. Today, TVH is a thriving, active organization with more than 60 paid members of all ages and experience, including several professional fiber artists. Members demonstrate at the regional agricultural fair, a spring arts festival, several venues for traditional Appalachian crafts, and historic houses. Our monthly meetings, which draw people from as far as 100 miles away, are filled with inspiration, mutual support, and energy. We should all be thankful to our patron saint, the “grandmother of local spinners,” Persis Grayson. UNC-TV’s “Folkways” program featured Persis Grayson in an episode about southern Appalachian folk arts (“Spinning, Dyeing and Weaving”) in the early 1980’s. The station has recently made the video available for streaming and the guild has purchased a DVD copy for our library. It is a rare and valuable opportunity to be able to watch the teacher whose work directly influenced our guild’s founding.